Although the strike is rather despicable and opportunist, perhaps next time around Sec. Hunt should spend more time crafting wise policy than texting New Corp. executives to tell them he’s eager to do their bidding. Border guards who disrupt the Olympics could be fired, Culture secretary Jeremy Hunt has suggested. The Culture secretary disclosed that some ministers wanted a “Ronald Reagan” approach to dealing with this weeks- eve of Olympics strike. The comments lift the lid on the concern at the top of Government over the planned strikes by the PCS union on Thursday, the day before the start of the Olympic Games. 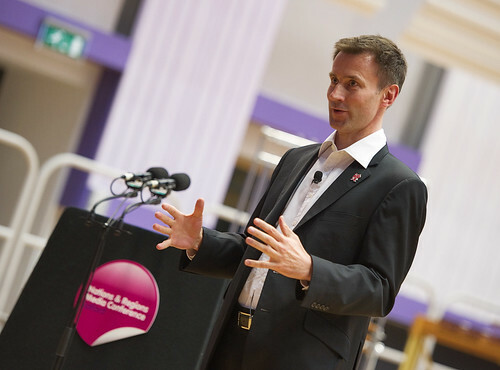 Culture Secretary Jeremy Hunt. Photo courtesy University of Salford Press Office. A split has emerged in the Coalition, after Chancellor George Osborne suggested laws at the weekend could be changed to make it harder for public sector workers to go on strike. One idea is only to allow a strike if more than 40 per cent of the officials vote in a ballot. In the PCS’s strike ballot, one in five border guards voted. Mr Hunt was asked by a sports presenter on BBC Radio Five whether the Border agency should say to strikers “sorry your job is not there any more” – and “sack them”. Mr Hunt said that there are hundreds of civil servants ready to step in to man passport check-in desks. Mr Hunt is thought to have been referring to when President Reagan in 1981 who responded to an illegal strike by federal air traffic controllers by dismissing ten thousand employees. The strike of thousands of border guards is organised for Thursday, but will run from early evening Wednesday to mid-morning Friday, to avoid any shifts cutting across strike day. Mr Hunt described the strike as an “absolute disgrace, totally out of sync with the way everyone is behaving [and] totally out of tune with the rest of the country”. Late last week Employment relations minister Norman Lamb told The Daily Telegraph that he was “so far unpersuaded” that unions’ powers needed to be curbed ahead. The PCS reacted angrily to the suggestion of sacking striking workers, saying that it would be break employment law which protected staff who stopped work. The PCS and UK Border Agency are now heading to the conciliation service Acas to try to agree a peace deal before Thursday. The news came as it emerged that David Cameron has set up a secret inner Tory Cabinet to deal with major threats to the Government. The group of seven ministers – William Hague, Iain Duncan Smith, Ken Clarke, George Osborne, Theresa May, Michael Gove and Philip Hammond – last met ahead of the Lords reform vote and convinced the Prime Minister not to risk defeat over a timetable motion for controversial changes. Separately, the PCS has complained to the BBC over the questioning of Mr Hunt by its sports presenter Garry Richardson, saying that the BBC had sounded more like “Fox News”. A BBC spokesman said: “Garry Richardson was seeking to clarify Jeremy Hunt’s views with robust questioning about the government’s response to the planned industrial action. “The questions did not represent a personal point of view but were designed to explore and test the government’s position.